I had a win, I think. I took photos on the river the other day of tiny holes in the sand and as I was down there taking the shot, I realised that there were 'bugs' running around too. I called them isopods, but I'm never confident with what I call things! So I Googled, and today I'm on a winner and doesn't that make me happy! 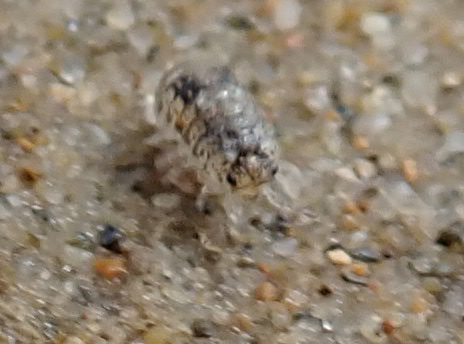 These were such tiny critters, maybe only the size of a pinhead. I noticed them only because of their movement. Picking them out in the photo took a bit of an effort too! 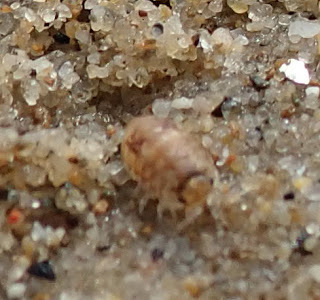 And I haven't quite got them in focus either, but see how tiny they are, they make the sand grains look big! You might remember the bugs from a huge media ruckus a couple of years ago after a person was 'attacked' by them. The Australian Museum blog has an article about Isopods that references the biting incidence. You can read it here. EDITED: amphipods is what they are called in a beachcombing book I recently picked up!